Trumeter Co Ltd have been designing and manufacturing world class distance measuring products for over 65 years, selling products all over the world. Design has been at the very heart of their philosophy leading to the launching of new products regularly in many industries, the latest new addition is an innovative and world beating electronic measuring wheel for the professional markets. The Measuremeter Revolution comes in a package with a price performance ratio envied by all our competitors. The challenge was to produce an electronic measuring wheel with all the features demanded by our most stringent customers at the same price as our current mechanical wheel. The new Trumeter digital Mini Measure Revolution available from Merlin Lazer Ltd , combines advanced and patented technology for the first time to a measuring wheel at costs previously unimaginable. Using the latest electronic design technology, Trumeter have manufactured an electronic distance measuring wheel with more features than ever before. The onboard microprocessor has the ability to apply mathematical calculations to the reading, making it capable of converting metres to yards or feet and inches at the push of a button. 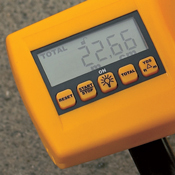 The accuracy of any measuring wheel is largely dependent on the honesty of the outside diameter of the measuring wheel, any debris picked up by the wheel will incur significant errors to the measurement, with this in mind all Trumeter's road and land measuring wheels are fitted with a mud scraper ensuring an accuracy of +/ 1% giving you the correct measurement time after time. The original and still the best Trumeter available from Merlin Lazer Ltd.